There are still several long and agonizing months before Cars Land officially opens at Disney’s California Adventure park but every time an update comes in from the “Imagineers” it feels a little bit closer. 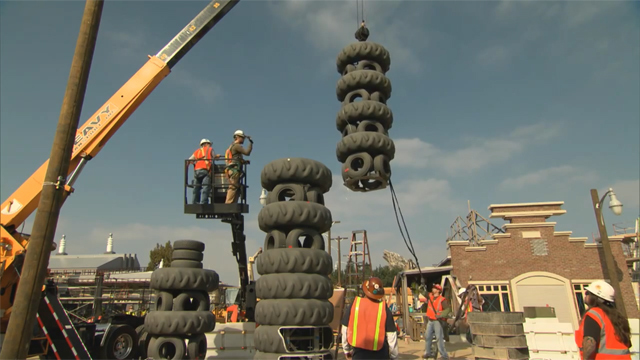 In the latest update we get to see the team erect the 35 foot tall “leaning tower of tires” outside of “Luigi’s Casa della Tires” which will be the site of the “Luigi’s flying tires” ride. Seeing everything come together makes me feel like a kid on Christmas morning getting his first remote control car. Yes, I went there… Anyway, if you want to see the tower of tires go up and get a quick preview of the flying tires ride then scroll down and watch the video below.